This comic masterpiece is read by Paul Schofield. It has been noted also by Dickens' biographer, Forster, that it marked a crucial phase in the author's development as he began to delve deeper into the 'springs of character'. 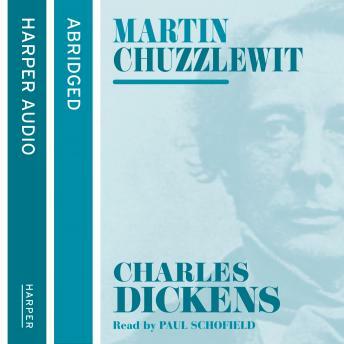 'Martin Chuzzlewit' is Charles Dickens' comic masterpiece about which his biographer, Forster, noted that it marked a crucial phase in the author's development as he began to delve deeper into the 'springs of character'.Old Martin Chuzzlewit, tormented by the greed and selfishness of his family, effectively drives his grandson, young Martin, to undertake a voyage to America. It is a voyage which will have crucial consequences not only for young Martin, but also for his grandfather and his grandfather's servant, Mary Graham with whom young Martin is in love. The commercial swindle of the Anglo-Bengalee company and the fraudulent Eden Land Corporation have a topicality in our own time. This strong sub-plot shows evidence of Dickens' mastery of crime where characters such as the criminal Jonas Chuzzlewit, the old nurse Mrs Gamp, and the arch-hypocrite Seth Pecksniff are the equal to any in his other great novels. Generations of readers have also delighted in Dickens' wonderful description of the London boarding-house - 'Todgers'.